1 Why is coffee ice cream called glace? 2 How to prepare Iced coffee? Coffee with ice-cream called glace (iced). Who first came up with a chilled drink to add ice cream - no one remembers. they say, that it was in Austria. but the recipe, it should be noted, of genius. perfectly cools, especially on a hot day, thus it gives cheerfulness and delight taste. Why is coffee ice cream called glace? Word "Glace" (from the French glace), which means frozen or icy. Therefore, the name of the drink can be translated as iced coffee, iced coffee. Iced coffee - is based drink chilled coffee, to which is added an ice cream ball. Often decorated with whipped cream, chocolate chips, nuts, cocoa powder, cinnamon, candy. Sometimes it is added and chocolate syrup to taste. Fed in a glass conical beaker, often used glasses for the Irish coffee on the leg with a pen, or simply glasses, put on a plate with a carved napkin. To put glace dessert spoon and drinking straws. Ice cream and whipped cream to eat with a spoon, and washed down with coffee through a straw, when the ice melted,, only use a straw. Interesting, it used the word glace of spelling rules were required to write two letters "c", today in the word there was only one letter "c". How to prepare Iced coffee? At first brew coffee on a favorite recipe with the help of the Turks, coffee maker or French-press, five minutes insist. Then we filter is required to use the strainer in a suitable container, We give a little cool, and put in the refrigerator. For cold Iced taken only well-chilled coffee, to 2-3aboutWITH. 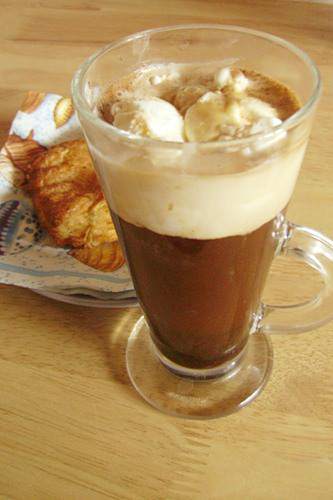 distinguish 2 type glace: cold Iced and cooled glace (coffee cooled to 10aboutWITH). Beat cream, prepare chocolate syrup. On the bottom of a glass of high glass bead spread cream, better to take the ice cream, coffee can, chocolate, vanilla, but not flavored or popsicles, it would kill the taste of coffee. Pour it chocolate syrup, topped up with chilled and lightly sweetened to taste coffee, put whipped cream on top, sprinkle with their nuts. you can try! Often recommend first glass pour the chilled coffee, and then placed on top of ice cream. Iced options can also be with additives cognac, liquor, egg yolk, finely crushed ice, syropov, milk. 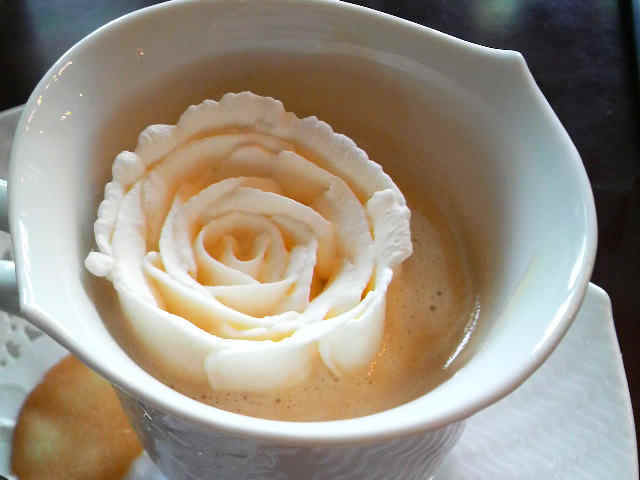 A so-called "Hot glace", When ice cream is added to the hot coffee, Iced itself is not. It is in its own tasty drink, but still "glace" comes from the French "ice".